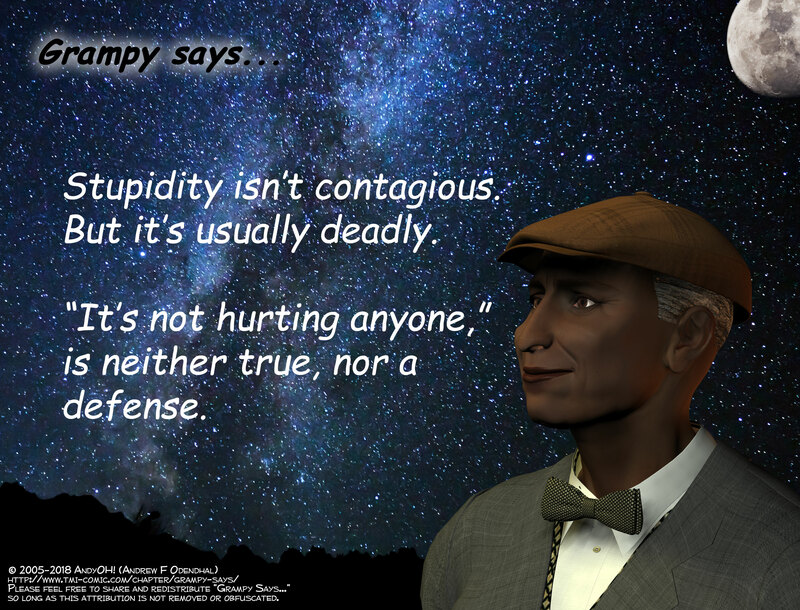 Grampy Says... - "Dumb and Dangerous"
Characters: Grampy "Prof. Will Jackson"
Anti-Vaxers at it again. Doesn’t matter what study after study has shown. Doesn’t matter to them that their sick kids kill other kids. "It's no hurting anyone," is neither true nor a defense. Well, I do agree: anti-vaxxers are dangerous to the rest of society…they are not, unfortunately, the only ones. Stupidity – Nature’s only capital offense. Science reporting has trained the public to not trust science. 1: Too often published results are not reproducible, so why are we surprised that many people don’t trust science? While we appear to be making some progress (the 2015 study: http://science.sciencemag.org/content/349/6251/aac4716 found over 60% of published results can’t be reproduced, and 3 years later: https://www.nature.com/articles/s41562-018-0399-z the failure rate appears to have improved to 38%), but I think that 38% failure is still too high to convince doubters. 2: Too often official “scientific” guidance is incorrectly simplified and later proven wrong. US gov guidance often still lumps together all “saturated and trans fat” as unhealthy (ex: https://www.google.com/url?q=https://www.cdc.gov/diabetes/prevention/pdf/postcurriculum_session2.pdf&sa=U&ved=0ahUKEwjj-9jiiJveAhUZFjQIHQudBAoQFggjMAY&usg=AOvVaw1fcHx3Nrmk4IVtA95avgYA). However there are hundreds of saturated and trans fats, and they can have very different effects on health. While there is strong evidence that some of the artificial trans fats in partially hydrogenated vegetable oil has killed housands of people, some natural trans-rumenic and trans-vaccenic acids have strong evidence of being healthy. There never was strong evidence against saturated fat, and there is growing evidence that different saturated fats have very different effects. I must disagree with Grampy. Stupidity [b]is[/b] contagious. People don’t just spontaneously start to believe that vaccinations are dangerous, after all. Or that jet con trails are signs that the government is distributing chemicals. Or that Trump is a self-made millionaire. You can only catch these particular kinds of stupid from other stupid people. And the only vaccination for it is knowledge. Go to enough meetings and you learn that stupidity is contagious. Some idiot can even talk a whole room full of smart people into a really stupid decision in spite of an incredible amount of evidence that it’s a stupid decision. My earlier comment was not to say that they are bad, but rather to highlight the source of a lot of the antivaccine groups reason for thinking that they are bad, as that there have been instances of bad batches (causes of which will vary), that they can be mishandled, and that individuals need to be aware of there own health issues. There are two sayings by robert heinlein in one of his books that i have always seen people prove are true, in my opinion. I always say that they will never get rid of stupidity because they breed faster than rabbits. They make more of their selves faster than they can be removed.